Availability: Selected retail stores and pharmacies. An effective deodorant can sometimes be difficult to find, and although I’m not a very sweaty person, I like to use a deo with a little added protection during the warmer months. I enjoyed this latest offering from Shield. Having never used one of their deodorants before, I was excited to give it a go, and used it religiously every day. Not only did I not sweat the entire day, but I could remain confident all evening too, as I remained dry and fresh. The product applied easily and spread without much effort on my part. It also dried relatively quickly, which is a major plus. My only criticism is that the scent of the deodorant was a little strong for me. I usually prefer a neutral scent that disappear once the product is dry, and unfortunately I continued to smell this one for quite some time after I applied it. Other than that, I was thoroughly impressed. Shield keeps me dry…super dry. This product is worth the spend, as you will feel confident even on summer days. I love the smell – it is good enough to wear to work as I don’t wear perfume to work, but I do for special occasions. It feels great on my skin – smooth and soft. The packaging is fine and fits into my handbag. It makes me feel fresh and confident and it lasts from the morning way into the evening. I would definitely, definitely recommend it !!!! I really like it because it keeps me smelling fresh all day. I would definitely buy it. I love the brands new look – it has a really refreshing look to it – much like the product which lasts till the end of the day. Shield has made great strides with this innovative technology. It beats my regular deodorant hands down. I am really impressed with Shield bringing us ladies World first technology – it shows that Shield really cares about us and that they are doing everything in their power to be more innovative. So since having had to use deodorant for the last 25+ years, believe me when I say that this is by the far the very best of the best! I’ve never been an aerosol kind of girl, so my choice has always been for roll-on’s – or “rub-a-dub” as my daughter calls them. This product goes on like a cream, absorbs quickly into the skin and serves its purpose, which is to keep you dry and fresh all day. But what really blew my mind was that while in the shower the following day, I could still get that clean “shower fresh” smell after applying it the day before. Now that’s 10/10 in my books! Perhaps it’s on the pricey side for some, but I’m happy to fork out the R80 bucks on a monthly basis because I know what I’m getting and it works. 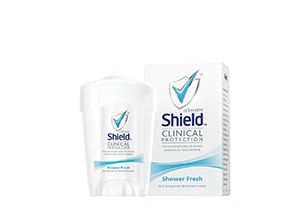 During hot days I sweat a lot, I tried the shield and I was dry and in summer I used all the time, just the scent can be overwhelming at times. This is amazing! It keeps me dry all day, smells amazing and of course won’t break my budget. I am one of those women who suffer from excessive sweating. I have being using the product and I am extremely impressive by it . It does dry the wetness and does not leave the white residuel on my arms or on my underarms. It combats bad odour and leaves me dryier until the next usage. I would recommend this product to women with excessive sweating . It is a bit pricey but the investment is well worth the cost.